62/92 David Mumpower The horse is more charismatic than Viggo Mortensen. 112/126 Kim Hollis Pretty horses. Horrible film. 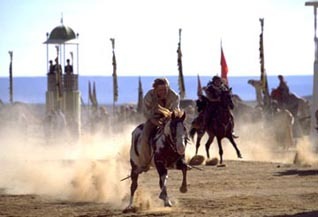 Based on an untrue story, Hidalgo tells the tale of a real historical figure, Frank T. Hopkins (played by King Viggo Mortensen). The man was a Pony Express courier who claimed to participate in a horse race in a foreign country. As it turns out, the story of Paul Bunyan and Babe the Ox is as legitimate as the yarn Hopkins created, but Touchstone has decided to bill it as factually accurate anyway. Michael Eisner is having a tough year. The pseudo-autobiographical tale of Hidalgo involves the love that dare not speak its name between man and horse. You see, Hidalgo is a mustang owned by Hopkins. The two of them are presumed to have built up quite a reputation racing horses in the western United States. Their notoriety precedes them to the point that Hopkins is considered the greatest rider in the Old West (though they just called it The West back then). A middle eastern stranger approaches our hero, and makes him an offer to enter a race. This is no ordinary competition, though. The event takes place in a treacherous part of the world nicknamed the Ocean of Fire. It's a 3,000 mile journey across the Arabian Desert. The competing horses are the finest bred Arabians of their day as trained by Bedouin riders. Many of these jockeys grow to resent the presence of the American, so they take steps to prevent his completion of the competition.